This isn’t new. 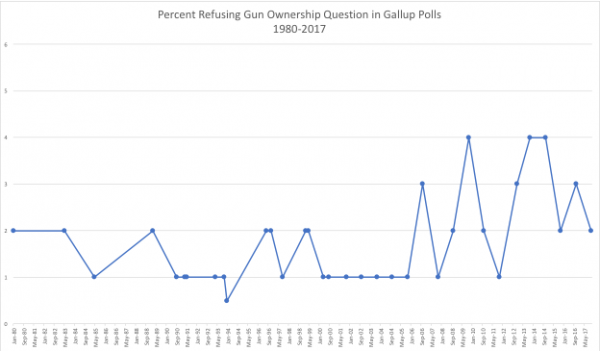 Take a look at the Gallup trend below; notice the sharp increase after 1993…right around the time Congress was working on a major gun control effort (the 1994 assault weapons ban). In December 1993, less than 0.5% of respondents refused to answer that question. In July 1996 (the next time the question was asked), 2% of respondents refused. The number acknowledging they had a gun in their household dropped from 49% to 38% in the same time period. The percent refusing first hit 4% in October 2009, then hit 4% again in October 2013 and October 2014 – when anti-gun politicians controlled both the White House and the Senate. The number of refusals dropped from 2016 to 2017. A simple trend line does not indicate causation…but one major difference between 2016 and 2017 was the political outlook. In 2016, there was a concern that a historically anti-gun politician could win the Presidency; by October 2017, President Trump had secured the White House. 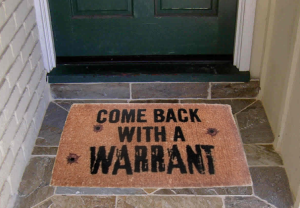 Now, look at the positive responses – those who admit there is a gun in their household. Does anyone really believe that gun ownership rates dropped ten points from December 1993 to July 1996, and then regained six points between that July and November 1996? This is clearly the most extreme example present and some fluctuation is to be expected due to sampling issues. However, the fluctuations – particularly when viewed in conjunction with the political environment – reinforce Urbatsch’s findings. Good advice for researchers everywhere. Think about that the next time you see an article claiming some high percentage of gun owners favor absurd restrictions.